Yesterday session was the 4th session of BITC training and we had a chance to make this chiffon cake. In fact, I didn't make chiffon cake before. One reason is I do not have a proper tin to make this cake. Another reason is, due to its appearance. It is not appealing to me (I didn't try chiffon cake before as well) and thus I didn't bother to try it out. However, after trying the chiffon cake which I made in BTIC, I realise it is a very delicious cake. The texture is moist , soft and it is just delicious as it is ,without adding any topping. 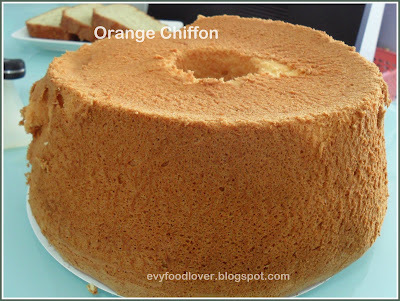 I am sure that I will be making chiffon cake often. Since it is a very soft and airy cake, the most challenging part is to un-mold the cake. We had to pay special attention on this part, otherwise the cake will have dents and it might even collapse. For my cake, I can un-mold nicely for half of the cake, but there was a big cut in the other side of the cake. Require more practises to perfect. Mix well group2 and group3. Add in Group1. Fold in half of the group 4 into the flour-liquid mixture till combine. Gently fold in the balance. Place in 23cm chiffon tin (do not grease it) and bake in 180 degree C preheated oven for 1 hour. Once bake, invert upside down to cool before removing it from the tin. Once cool, gently remove it and ready to serve. Enjoy! 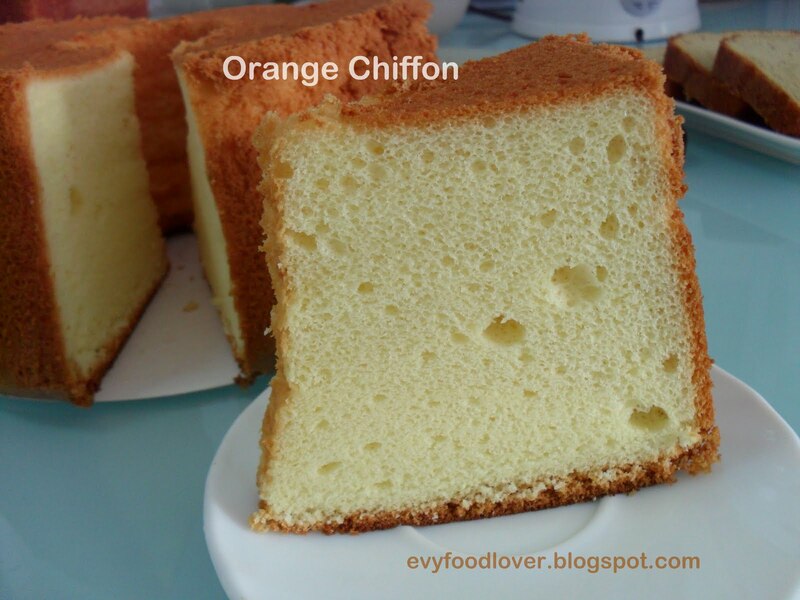 yah, chiffon cake is very spongy and soft. I like it too. your first time unmoulding skill is still great. I could not get out the cake as good as yours. I always look forward your post on baking class..